Juice has come a long way since 2014. Juice the eight-member band with Boston College origins, that is. 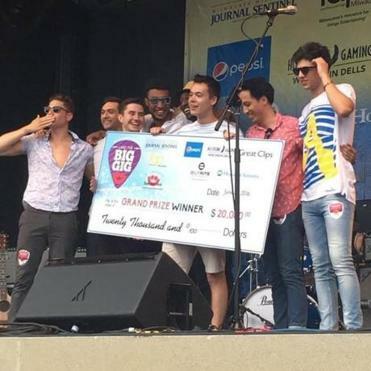 The octet, which has a funky jam band vibe, played their very first festival gig last Thursday and walked away $20,000 richer after winning the Land the Big Gig music competition, a part of Milwaukee’s 11-day Summerfest music festival (which claims to be the world’s largest). Grammy-nominated producer-sound engineer Johnny K, who’s worked with bands like the Plain White T’s and 3 Doors Down, was among the judges. It’s not the first time the local band has emerged victorious in a music competition; Juice started out as a group of BC freshmen (plus one foreign exchange student) that, within days of forming in 2014, won the school’s Battle of the Bands. We’re guessing last week’s win felt a little sweeter. Band members include Ben Stevens, Kamau Burton, Christian Rougeau, Daniel Moss, Miles Clyatt, Chris Vu, Rami El-Abidin, and Michael Ricciardulli. They released their debut self-titled album in April.